How can I stop a Staffy chewing? This is an extremely common question for both puppy and dog owners. All dogs like to chew but it can be a problem when they aren't aware of what they can and can't destroy. 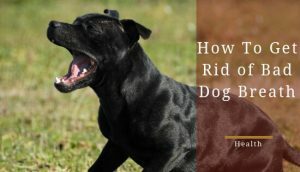 This articles features some information on the nature of dog chewing and a set of quick, helpful tips you can use to prevent your dog from destructive chewing. The first step to teaching your dog to stop chewing stuff is to understand why they might be chewing in the first place. There can be many reasons a dog or puppy chews everything he can find. Below are some of the most common reasons for destructive chewing. 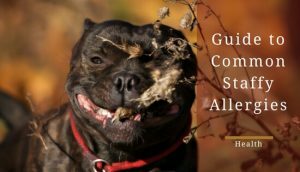 By being aware of the potential reason behind your own staffy's chewing, you can use the tips later in the article to combat the situation more effectively. Let's get the obvious one out of the way first. If your Staffy is very young, chewing is most likely a sign that he/she is simply teething. 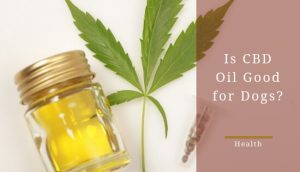 The process is similar to infants who teethe. When a puppy loses its baby teeth, he/she experiences pain and discomfort while the adult teeth are coming in through their gums. Generally, a Staffy's "baby" teeth will start falling out when they are around 4 months old. The adult teeth should be in place at around the 8-month mark. Dogs, in particular puppies, can also chew as nothing more than exploration. If a puppy is still young, or a dog is new to your home, it can be a way of exploring his environment. Of course, dogs can't grab and insect items with their paws so they use their mouths. Adult-aged dogs often chew when they are hungry. Perhaps they are simply not getting enough to eat and are falling below their required calorie intake. 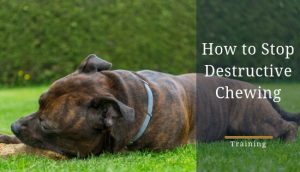 If you're dog is losing weight and you find them below the ideal weight for a staffy, this could be the reason for their chewing habits. Many dogs chew because they are bored. Whether your pup is left alone for long periods of time or not receiving enough attention when you are home, boredom may cause them to find their own entertainment and chew everything in sight. They might also be looking for a reaction from you. Following on from boredom chewing, a dog may have extra energy pent up that it wants to release due to a lack of exercise. This lack of exercise can result in chewing. Plenty of physical exercise is important for Staffies of all ages. If he does not have it, he may take out his energy on objects he finds around your home. 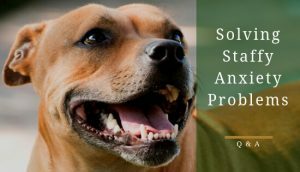 If you want some more creative ways to satisfy your dog's activity needs, here is an article I wrote on exercise ideas for Staffies. You might not have considered it but stress can make a dog chew. Similar to people, your pet can experience general anxiety, separation anxiety, and even frustration. Chewing and destroying objects may can become an outlet and source of comfort when a dog is feeling stressed out. In some cases, chewing can a sign of illness. Your dog may have a gastrointestinal problem, or nutritional deficiencies. 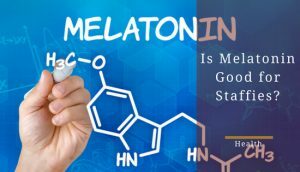 He can chew as a way to relieve physical discomfort when he is ill.
Of course, if you have any suspicion that this could be the case, you should consult your vet as soon as you can. Now that you're aware of some potential reasons behind your dog's chewing, you can use the information below to work on remedying the situation. Rule out illness. Your very first step should be a visit to the vet to rule out any illnesses. This is especially true if your dog is older and the chewing is a recent problem. It is always better to be safe than sorry when it comes to your staffy's health. Soothe teething pain. 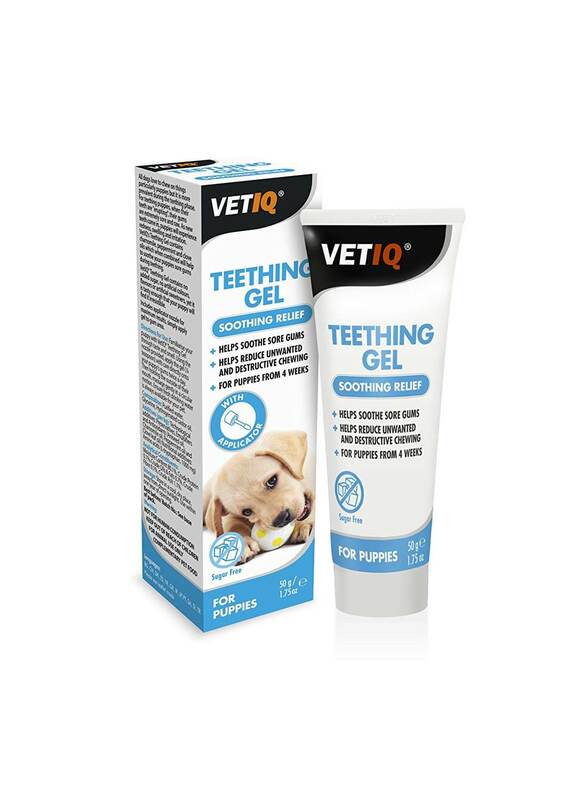 When it comes to teething, the main way to stop a puppy chewing starts by relieving the discomfort. You can teach him to chew on frozen or cold, damp washcloths since the cold will help sooth their gums. Putting a chew toy in the freezer can also work. Eliminate boredom, stress and anxiety. If you feel the chewing due to boredom or stress, try to not leave your dog alone for long periods of time. Try to give him or her plenty of attention when you are at home. When you do need to leave the house, make sure your dog has plenty of the toys they like to keep them occupied. For a dog that get anxious or stressed when you leave home, tricks like leaving a television or radio on can help to soothe them. Here's a full article if you want more info on calming an anxious staffy. Exercise your dog more. If you think your dog's chewing is down to them having too much excess energy or a lack of exercise, it can be easily remedied. Aim to take your staffy for a walk at least once each day. Choose special toys that help them stay active. Make daily playtime a fun experience for both you and your pet. This can also help prevent the exploration chewing I mentioned earlier since dogs who chew to explore can have their attention diverted to more appropriate activities. Remove temptation. A simple measure you can take to reduce the risk of your dog destroying your items is to take measures for dog and puppy-proofing your home. Puppies, in particular, can make mistakes when they are first learning not to chew so avoid leaving tempting objects in sight. Keep lids on bins, get shoes out of reach, don't leave clothes and jackets lying around. Try a chew-deterrent. If you find it hard to get your dog to stop chewing certain items or you're unable to supervise them at all times, a chew-deterrent spray might help. The idea is that the taste isn't pleasant to most dogs so will stop them chewing any item that has been sprayed. It is understandable if you are frustrated when your pet is chewing destructively, especially if it is an object that is important to you. 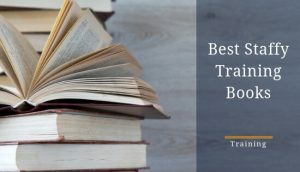 However, for the sake of your relationship with your dog, there are some mistakes you cannot afford to make. Shouting, hitting (definitely not! ), confining to a "punishment" area or making them wear a muzzle are all likely to backfire. Your dog will not understand why it is being punished and their behavior can worsen as a result of the confusion. 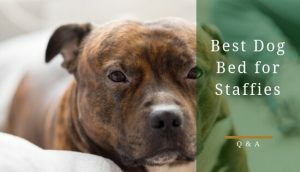 These kinds of approaches can also cause your pet to stop trusting you and your sweet-tempered, loving staffy may become distant or even agressive towards you. Secondly, do not give him objects to chew that can be harmful to dogs and puppies. This goes without saying but it is worth double-checking everything you decide to give your dog. 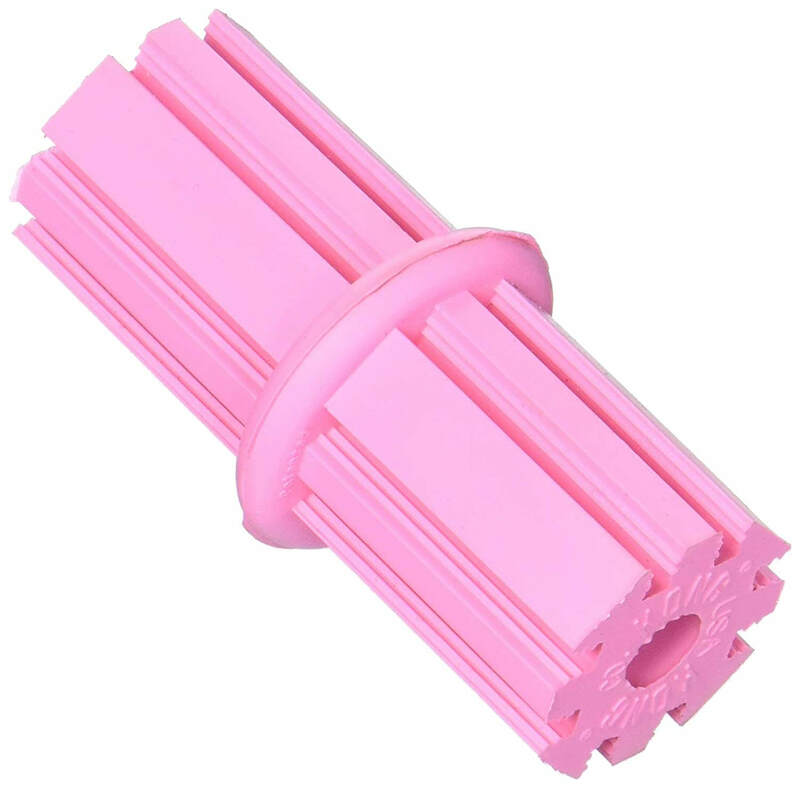 For example, sticks and certain types of bone can be a choking hazard. When you give him alternative objects for chewing, make sure they are safe. Finally, avoid the temptation to simply ignore your pup's destructive chewing. This habit will not end overnight so do not expect immediate results. With time and patience, you can work with your dog to help them learn which objects are simply not for chewing.